Do you have a friend or family member that is into cycling? 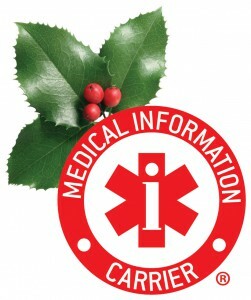 Consider a Medical Information Carrier as a stocking stuffer at Christmas. It is a useful gift that shows you care about their safety when they are riding. It’s an ID for their bicycle helmet that carries their personal medical history. It’s as easy as 1-2-3! 1.They simply write their medical information on the supplied data form. 2. They insert sheet into the appropriate carrier. 3. They affix the carrier to the helmet in the correct place.